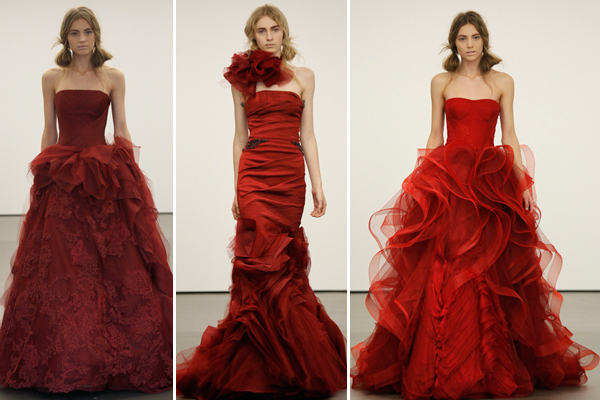 Here Comes The Red, Maroon and Peplum Bride?? 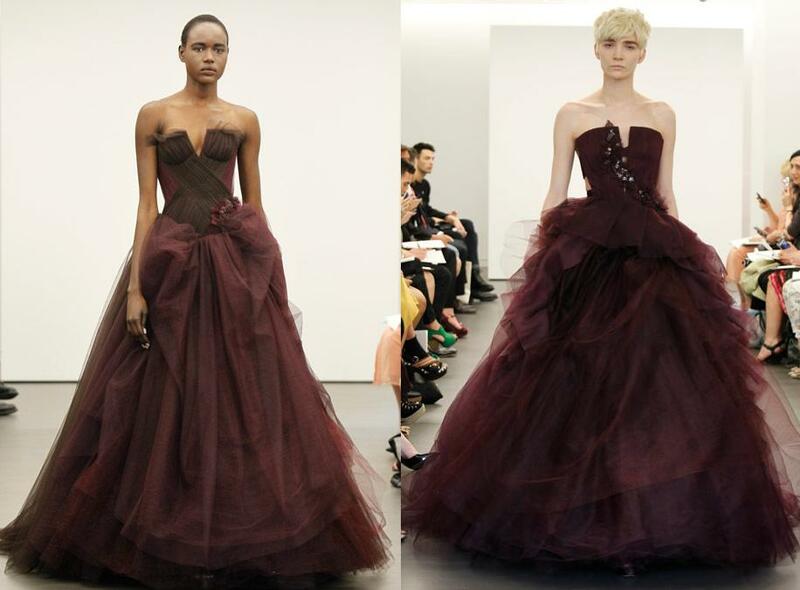 Eggplant Ball: eggplant/maroon colored strapless gowns from the Vera Wang Bridal Collection Spring 2013--These are shown on the runway for "impact" and to deliver a "Designer's Vision" but the samples that end up in the salons will probably be white, off-white and creme, of course. 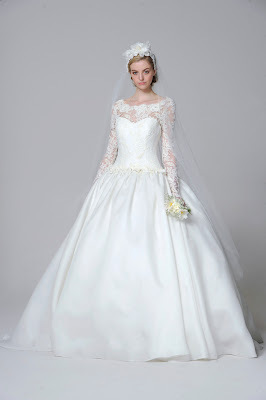 And some could probably work for the bridesmaids, Maid-of-Honor, and so on--if they are willing to do a "Pippa" and upstage the bride! 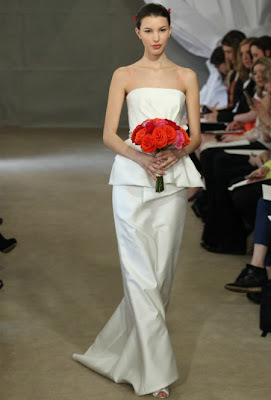 Peplum Ladies: Several designers showed the peplum detail in some of their Spring 2013 offerings--Here are two from Venezuelan-born designers: (Left to right) Angel Sanchez strapless fitted gown with asymmetrical cascaded peplum detail; Carolina Herrera strapless gown with peplum detail. 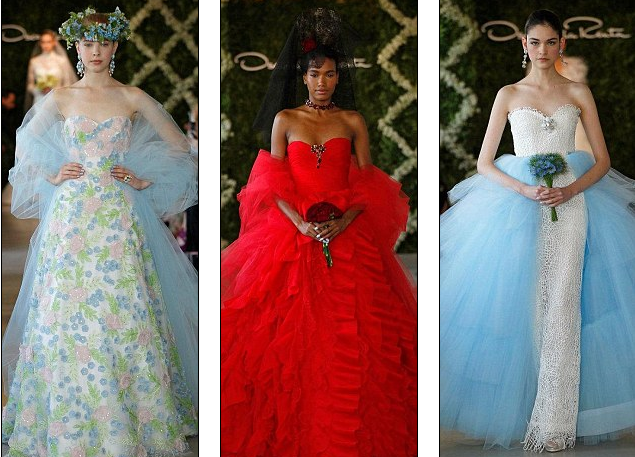 Marie Antoinette Goes Hunting vs Princess Di Redux: Two ball gown/"Princess"-style offerings during NY Bridal Fashion Week Spring 2013--(Left to right) Carolina Herrera Bride Collection Spring 2013 strapless gown with a "double breasted" silhouette drop-waist torso and folded-and-pleated gown skirt; Marchesa Bride Collection Spring 2013 ball gown with drop-waist bustier and lace neck-and-sleeve detail and very 80's shape. 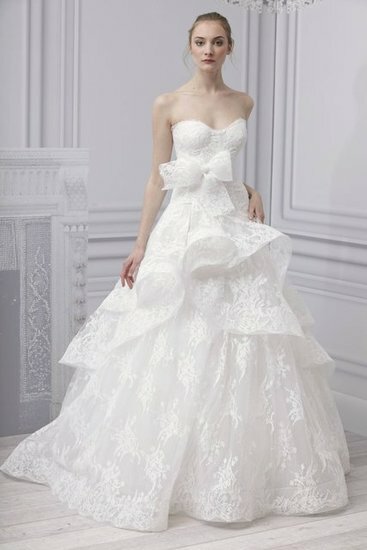 NIKOLAKI Brides: Finally, here are a couple of my own NIKOLAKI Collection Bridal gowns: (left to right) strapless off-white stiffened high-low gown in hand-made sequins/paillettes and "crushed" silk organza; strapless fitted silk duchesse gown with full pleated "Watteau" back. 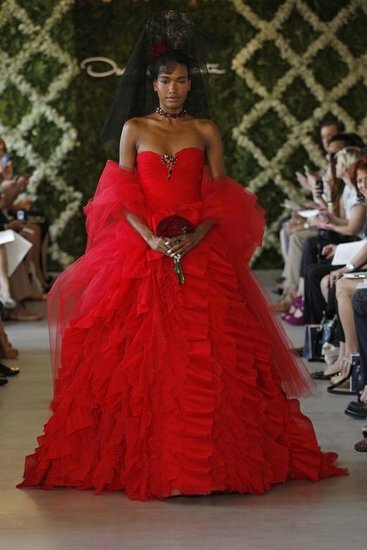 0 Response to "RUNWAY REPORT.....NYC Bridal Fashion Week Spring 2013"